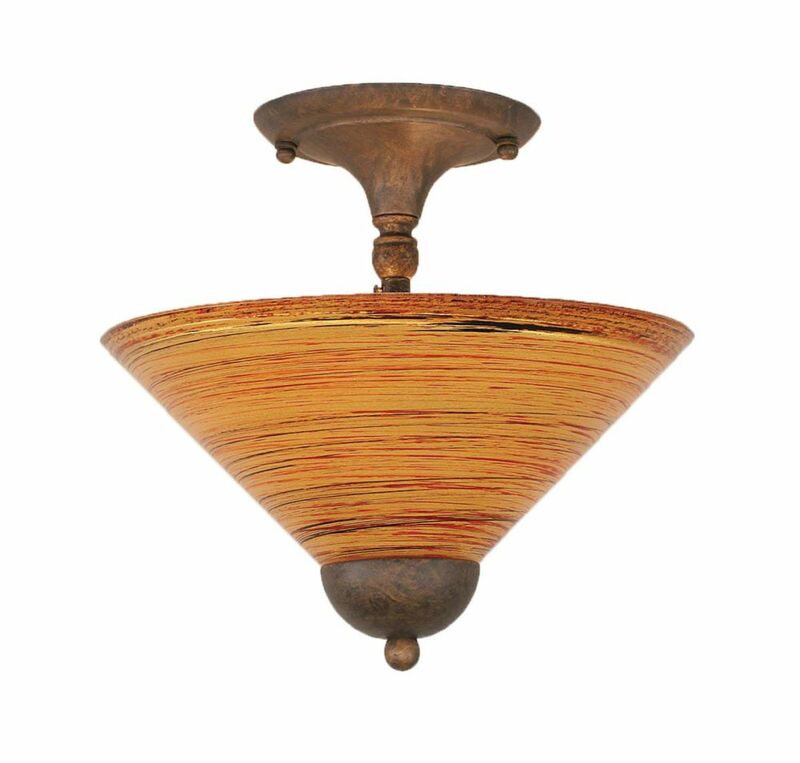 Inspired by vintage motif, this ceiling light perfectly marries the modern elegance of the past with the flare of anew. Finished in a beautifully refined Burnished Antique Brass finish accented by clear glass rods, this semi flushmount is destined to withstand the ages. Made with solid steel construction to look great and last for years to come. Reduce your costs with an energy efficint fixture. Saving energy has never been so easy without sacrificing style. This energy efficient semi-flush fixture is ideal for a foyer, kitchen, bedroom and utility room. Finished in brushed nickel with heavy frosted glass make this fixture easy to coordinate with today's colour schemes. A fashionable bell metal bronze finish combines flawlessly with satin etched shades, making this Sea Gull Lighting semi-flush sleek and sophisticated, while the energy saving fluorescent bulbs make it practical. The 26 watt bulbs give off the ideal amount of light for any indoor application. If you are looking for a bold, new age accent for your home look no further. A fashionable blacksmith finish combines flawlessly with cafe tint shades, making this Sea Gull Lighting semi-flush sleek and sophisticated, while the energy saving bulbs make it practical. The 100 watt bulbs give off the ideal amount of light for any indoor application. If you are looking for a bold, new age accent for your home look no further. Concord 2-Light Ceiling Bronze Semi Flush with a Firré Saturn Glass The cornerstone of the concord Collection is quality, and this semi flush is no exception. Combining a classic bronze finish and posh styling, you will find no better way to highlight the charm of your home. With the superb craftsmanship and affordable price this fixture is sure to tastefully indulge your extravagant side.